With great roads and tourist and service facilities infrastructure the country, and this trip in particular, is the best choice for those who come to the tropics for the first time. 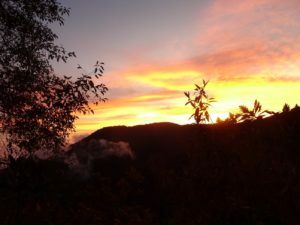 Our adventure started in San José, the capital of Costa Rica, and we managed to explore different habitats and ecosystems, ranging from the Caribbean foothills to the cloudforest mountains of Savegre in central Costa Rica to end at the Pacific slope at Carara National Park and the Río Tárcoles. Of the 934 species of birds that occur in Costa Rica we managed to record more than a third in a week only! We recorded 320 species as well as an additional three species that were heard only. Our trip list included sightings of amazing species such as Resplendent Quetzal, Boat-billed Heron, American Pygmy Kingfisher, Violet Sabrewing, Black Guan, Spotted Wood Quail, Streak-chested Antpitta, Silvery-fronted Tapaculo, Great Potoo, Spectacled and Crested Owls, Flame-throated Warbler, Long-tailed Silky-flycatcher, Fiery-billed Aracari, Spot-fronted Swift, Prong-billed Barbet, American Dipper, White-crested Coquette, Black-crested Coquette, Black-and-yellow Tanager, Spangle-cheeked Tanager, and White-eared Ground Sparrow. 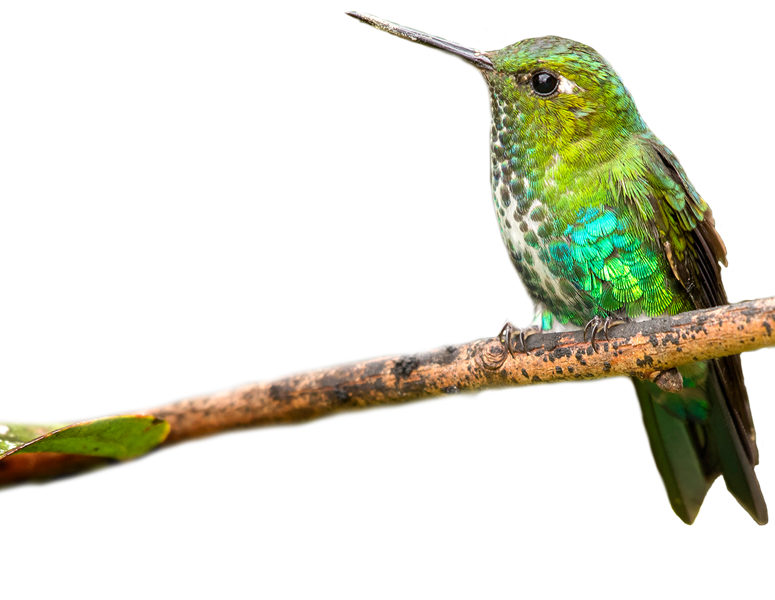 In addition we managed to see two country endemics that occur on the mainland, Coopery-headed Emerald and Mangrove Hummingbird, and we saw 41 birds that are shared only by Costa Rica and Panama. A nice selection of North American migratory warblers was also found, such as Chestnut-sided, Black-and-white, Golden-winged, Bay-breasted, Prothonotary, Black-throated Green, and Wilson Warblers, and 35 species of hummingbirds. It was a memorable trip, with some participants visiting the tropics for the first time, a nice group of clients, great weather, excellent food, amazing wildlife, and friendly people all over the country. We hope that you can join us on our Costa Rica Escape 2020 tour. We arrived at Juan Santamaría International Airport in Alajuela, a town located 20 kilometers from San José city, and then transferred to our hotel. We had arranged to leave the hotel at 7:00 a.m. after breakfast, but since we were excited and full of adrenaline we met before breakfast already and spent a few hours exploring the hotel grounds, looking for new birds. We met just after dawn to find our first species, including Great-tailed Grackle, Rufous-backed Wren, Clay-colored Thrush, Inca Dove, Hoffman’s Woodpecker, Great Kiskadee, Spot-breasted Oriole, Baltimore Oriole, Melodious Blackbird, American Yellow Warbler, Summer Tanager, and Greyish Saltator. There is nothing better than traveling with birders who set foot for the first time in the Neotropics and everything turns out to be new, even Rufous-collared Sparrow. The group was happy and excited, and things could not have turned out any better when the owner of the hotel pointed out a Ferruginous Pygmy Owl in the hotel gardens, which posed well for everybody. Then we had a tasty breakfast and left the hotel to start our trip. We climbed to an elevation of 1200 meters (3900 feet) to the Freddo Fresas restaurant feeders. As soon as we arrived the group was completely amazed to see the impressive Violet Sabrewing coming to the feeders. Other species here included Mountain Elaenia, Clay-colored Thrush, Blue-grey Tanager, Scarlet-rumped Tanager, Bananaquit, Slaty Flowerpiercer, and a glimpse of the elusive White-eared Ground Sparrow. 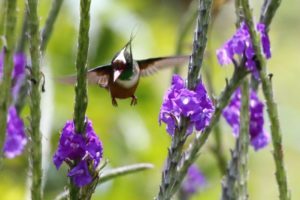 Later we continued to the La Paz Waterfall center, where the feeders where brimming with Violet Sabrewing, Black-bellied Hummingbird, Purple-throated Mountaingem, and the endemic Coppery-headed Emerald. It was nice to study males versus females, learn the differences, and get used to them. The forest trails leading to the waterfall were very birdy, allowing us views of Slaty-backed Nightingale-Thrush, Northern Tufted Flycatcher, Spangle-cheeked Tanager, Ochraceous Wren, Slate-throated Whitestart, Tennessee Warbler, Prong-billed Barbet, and Sooty-faced Finch. We had a nice lunch and then decided to walk the trail all the way down to the base of the waterfall, hoping for American Dipper, which sadly we could not find here. But on the way we had good views of Torrent Tyrannulet, Slaty Antwren, Spotted Barbtail, and Red-faced Spinetail. The trail-and-steps system that leads down to the waterfall was very productive and allowed good views of the waterfall, but perhaps weekends should be avoided since the place can be crowded. Some participants managed to get views of Purple-crowned Fairy when we were leaving the restaurant area. Then we hit the road again toward the Cinchona and Virgen del Socorro areas. On the way we stopped the vehicle to get scope views of White-crowned Parrots and a nice Bat Falcon. We also were excited about the first flocks of oropendolas, since we did not know yet how much closer we would come to them over the next two days. At the Cinchona feeders we had great views of Silver-throated Tanager, Scarlet-rumped Tanager, and Buff-throated Saltator, when suddenly a Black Guan showed fabulously for the enjoyment of our group. Daylight was vanishing, but we still wanted to visit one more place, the Virgen del Socorro bridge, only to get thrilled there with views of two American Dippers. Other birds here included our first Chestnut-sided Warbler, Bay Wren, and Zeledon’s Antbird. We also were lucky enough to spot a single White-nosed Coati before we got back to the vehicle. 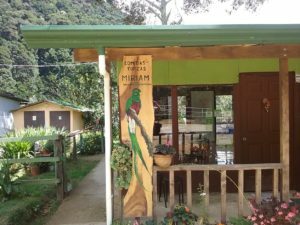 We continued our drive to our comfortable accommodation at Quinta Sarapiquí, where we arrived before dinner and had a rest in anticipation of the big day that was about to come, visiting the famous La Selva Biological Station. Indeed, this had been a great day! La Selva Biological Station is one of tropical America’s most important ecological research facilities. 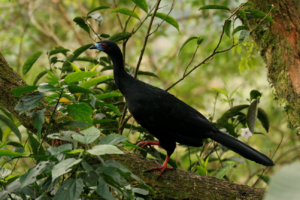 It is also one of Costa Rica’s most renowned birding destinations. Since its creation in 1968 more than 3,100 scientific papers have been published based on research conducted within the forests of La Selva Biological Station. The station is located on 4,050 acres of lowland forest bordering Braulio Carrillo National Park, and it creates an important corridor from the lowlands to the high mountain peaks. We arrived at La Selva at first light. Just at the entrance by the parking lot we had good views of Great Antshrike, Fasciated Antshrike, Scaled Pigeon, Short-billed Pigeon, Brown-hooded Parrot, Boat-billed Flycatcher, Montezuma Oropendola, Chestnut-headed Oropendola, Black-cheeked Woodpecker, Northern Barred Woodcreeper, Cinnamon Woodpecker, Chestnut-sided Warbler, Red-lored Amazon, Stripe-throated Hermit, Common Tody-Flycatcher, Grey-breasted Martin, and Keel-billed Toucan. We also had scope views of a female Snowy Cotinga. We started walking and exploring the trails, including the ones located at the other side of a suspended bridge over the Puerto Viejo River. We also had perfect weather and were excited with sightings of species such as Black-throated Trogon, White-ringed Flycatcher, Rufous-winged Woodpecker, Collared Aracari, Wedge-billed Woodcreeper, Yellow-throated Toucan, Green Kingfisher, Grey-headed Chachalaca, Semiplumbeous Hawk, Masked Tityra, Black-crowned Tityra, Golden-hooded Tanager, Plain-colored Tanager, Red-throated Ant Tanager, White-whiskered Puffbird, White-fronted Nunbird, and Black-cowled Oriole. One of the greatest moments of the tour came when we decided to look for a potential roosting tree for Vermiculated Screech Owl. Kevin and I walked into the forest, tracking down the owl’s call, while the group remained behind on the main trail. Suddenly before we localized the owl the very bird and a pair of Great Tinamous walked in front of the group. 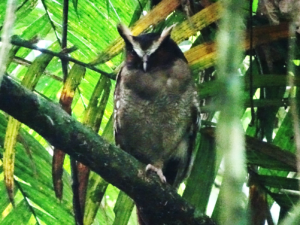 When we noticed them and turned back to tell the group they had already observed this shy species, but they did not tell us because we had asked them to remain quiet while we were trying for the owl. This was an incredible moment and quite funny for the whole group. However, we continued looking for the owl, just to find not only the Vermiculated Screech Owl but also a Crested Owl, both roosting at daytime in the same area. Incredible! Another truly nice moment was watching a pair of Great Green Macaws flying low above the canopy forest, but only a few members of the group managed to see them perched. 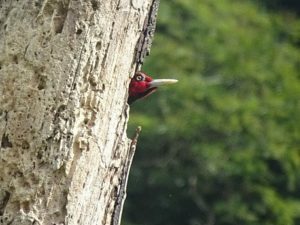 Another top moment was getting full views of Chestnut-colored Woodpecker, one of our main targets at La Selva. After a good morning and before we left the research station during the midday heat we had a cup of coffee in the main dining room of the research station, where surprisingly we found a Grey-chested Dove that was imprisoned in the dining room. After we had watched it well we set it free. Then we went back to our hotel to enjoy a good lunch, and in the afternoon we returned to La Selva. 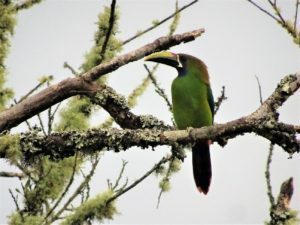 The activity was slower than it had been in the morning, but we had incredible views of Rufous and Broad-billed Motmots, Black-throated Trogon, Crested Guan, Blue-chested Hummingbird, and Buff-rumped Warbler. Later we tried to see a Slaty-breasted Tinamou calling very close, but it did not come for us, and then we had strong rain. La Selva also provided good views of Collared Peccaries and Mantled Howler Monkeys. But it was getting late, so we returned to the lodge. Probably one of the longest days of the trip started by visiting the Río San José. Here early in the morning we had good views of Fasciated Tiger Heron and the uncommon Spot-fronted Swift flying among a flock of Grey-rumped Swifts. We also had probably one of our best sightings of Cinnamon Woodpecker here. Then we drove to the Cope Wildlife Reserve, which is a local private home of a family involved with ecotourism, and they have excellent feeder settings. During the next hour or so we were delighted with enjoying close-up views of Montezuma Oropendola and Chestnut-headed Oropendola on the feeders, Green Honeycreepers, dozens of Red-legged Honeycreepers, Silver-throated Tanager, Crimson-collared Tanager, Black-cheeked Woodpecker, Baltimore Oriole, and Melodious Blackbird. 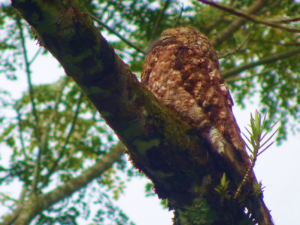 We saw a fascinating Brown-throated Three-toed Sloth with his offspring, and after that we took a drive to explore the vicinity of this private reserve, during which, with the help of a local guide, we managed to find another Crested Owl roosting. In addition we found a pair of Spectacled Owls and a Great Potoo, all roosting at daytime, and a Pale-billed Woodpecker in its nest. After great birding in the Cope Wildlife Reserve we visited the well-known hummingbird hotspot El Tapir (old butterfly garden). Here we enjoyed Black-crested Coquette, Violet-headed Hummingbird, Crowned Woodnymph, Rufous-tailed Hummingbird, and Wire-crested Thorntail, but despite all our efforts we could not find the Snowcap, which apparently is scarce and shy close to the very aggressive Rufous-tailed Hummingbird. We also saw Black-and-yellow Tanager and had a brief view of a juvenile male Three-wattled Bellbird. Then we hit the road and headed to San Gerardo de Dota in the Cordillera de Talamanca. Two full days of birding in pristine cloudforest were about to come our way, and we could not have been more excited. We arrived at Savegre Lodge at dusk just in time to drop our luggage and enjoy a delicious dinner. Today we left the hotel before dawn and enjoyed an incredible night sky. 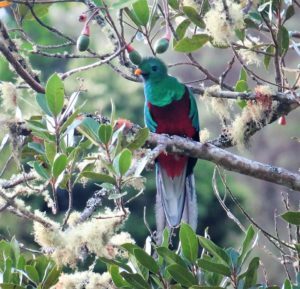 We went to look for Resplendent Quetzal, probably one of the most-wanted species in the tropical Americas. We arrived to a place where we knew that it was showing regularly, but we had to wait for some time. In the meantime we had views of several Black Guans and of our first Mountain Thrush. There were quite a few people from other lodges who gathered in this specific spot, when suddenly a full adult male made an appearance and perched not far from the road on its favorite tree. We spent a good time enjoying it; it was amazing! 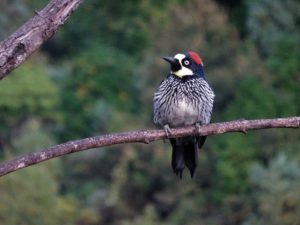 We returned to the lodge to have breakfast and enjoyed some of the birds that occur around the garden, such as Long-tailed Silky-flycatcher, Flame-colored Tanager, Talamanca Hummingbird, and Acorn Woodpecker, and we had a glimpse of Western Osprey. Some people may ask why there is an osprey in the mountains.  Well, the local people who live in the Central Valley near Savegre have built several trout farms, and that is probably why our friend was flying around. By 8:30 a.m. we took one of the hotel’s old jeeps, which transported us above the Savegre Lodge. The great forest above the lodge is good for birding and holds a few excellent species, so we started with nothing less than a family covey of Spotted Wood Quail followed by Ruddy Pigeon, Grey-breasted Wood Wren, Flame-throated Warbler, Black-throated Green Warbler, Collared Whitestart, Philadelphia Vireo, Ruddy Treerunner, Black-capped Flycatcher, Spangle-cheeked Tanager, Black-and-white Warbler, Ruddy-capped Nightingale-Thrush, and the skulking Silvery-fronted Tapaculo, which was the first tapaculo for almost the whole group (however, just wait and come to northern Ecuador or northern Peru with us!). Some of the participants also managed to get good views of the elusive Black-faced Solitaire. It was a great hike, and we managed to walk all the way back to the main road near the lodge. We had a break after lunch and then headed back to the road to visit Miriam’s feeders above Savegre. The feeders were brimming with activity, and we did extremely well with species such as White-throated Mountaingem, Talamanca Hummingbird, Volcano Hummingbird, and even Fiery-throated Hummingbird. The fruit feeders attracted Acorn Woodpecker, Hairy Woodpecker, Flame-colored Tanager, Large-footed Finch, and Yellow-thighed Finch. Just before the end of our visit here a Blue-throated Toucanet materialized to fill Tracy’s heart with joy! After enjoying the feeders we climbed up to higher elevations, where just at sunset we found another one of our targets, the range-restricted Black-cheeked Warbler. We then waited until dusk to look for Dusky Nightjar, which was very responsive after dusk, but we could not see it until we started driving back to Savegre Lodge. But when we arrived at the lodge we had splendid views of one individual hawking for moths at a street light. The next day we left the lodge toward Los Quetzales National Park, the highest elevation of the tour at 3000 meters (9840 feet). Along the drive we managed to see Black-billed Nightingale-Thrush. We reached the top and were amazed by the remains of paramo and the pristine habitat; it was stunning scenery. As soon as we arrived we started to look for our two main targets, the range-restricted Volcano Junco and Timberline Wren. Fortunately it did not take long to have great views of both targets; so with no other target birds to look for we started our drive to the Pacific slope. We kept driving along the main road until we reached Bosque de Tolomuco and a nice B&B property, which provided great hummingbird and tanager feeders. We had a good start with our first White-tailed Emerald and Snowy-bellied Hummingbird; however, our main target was the stunning White-crested Coquette, which can be seen at this property. It did not take long to admire our first White-crested Coquette females, but there was no trace of the male yet. We also had time to check the tanager feeders, where we saw more Silver-throated Tanagers, Blue-grey Tanager, Palm Tanager, and Golden-hooded Tanager. We also found Rose-breasted Grosbeak, Scarlet-rumped Tanager, Elegant Euphonia, and Red-crowned Woodpecker. Fortunately the group was together when the spectacular male White- crested Coquette showed up for a minute only, not to come back again. When we continued our drive toward Villa Lapas we found a nice birding stop at the coast, with several Wood Storks, Roseate Spoonbill, Great Egret, and Tricolored Heron, and our first view of the splendid Scarlet Macaw flying along the shore was a real treat. We also saw Northern Crested Caracara and Yellow-headed Caracara, a nice Scissor-tailed Flycatcher, and Grey-crowned Yellowthroat. At our comfortable hotel we still had time to get ready before dinner. Central American Agouti was seen around the garden, and Pauraque showed well for everybody after dinner. We started the day with getting incredible views of the localized Fiery-billed Aracari in the hotel grounds and then drove to Carara National Park, where we spent the whole morning birding and exploring the main trails. Carara National Park is one of the most famous birding destinations in Costa Rica. The park is located at the northernmost site of the South Pacific Slope on the southern bank of the Río Tárcoles, the river that forms the boundary between the North- and South-Pacific regions. Since it is situated in the transition zone between tropical dry forest and tropical wet forest, Carara offers a unique and extremely diverse ecosystem, protecting 11,600 acres of land. Here we found species such as Long-billed Gnatwren, Dot-winged Antwren, Black-hooded Antshrike, Black-striped Woodcreeper, Chestnut-backed Antbird, Tawny-crowned Greenlet, Riverside Wren, Black-faced Antthrush, and Rufous Piha, and we had fantastic views of Streak-chested Antpitta. We tried hard for Orange-collared Manakin, but only a few participants managed to see the only elusive individual we found. In the parking lot a group of Central American Spider Monkeys and King Vulture where photographed by Debbie while she was waiting for the group. We came back to the park in the afternoon and managed to see a nice selection of birds taking a bath in a forest stream, with super views of a single male Blue-crowned Manakin, at least five different Red-capped Manakins and one female as well, Northern Schiffornis, Ochre-bellied Flycatcher, White-shouldered Tanager, and Blue-throated Sapphire. Toward evening we returned to the hotel for a nice dinner, another satisfying checklist session, and a few free drinks that were very welcome after a long and hot day. Our last day of the trip started with crossing the famous crocodile bridge on foot, from where we saw several American Crocodiles and also Black-necked Stilt, Black-bellied Whistling Duck, Neotropic Cormorant, Great Egret, Snowy Egret, and Cabanis’s Wren and had a wonderful view of Turquoise-browed Motmot. We drove to the dock to get our boat to explore the mangroves of the Tárcoles River. We had a great time, enjoying Magnificent Frigatebirds, American White Ibis, Bare-throated Tiger Heron, Northern Jacana, Green Kingfisher, the elusive American Pygmy Kingfisher, Panamanian Flycatcher, Northern Scrub Flycatcher, Scaly-breasted Hummingbird, and good views of the endemic Mangrove Hummingbird. We also had good views of Yellow-crowned Night Heron, Mangrove Swallow, and Crab-eating Raccoon. Along the river we saw more American Crocodiles, Common Basilisk, and Common Spiny-tailed Iguanas but also Whimbrel, Spotted Sandpiper and Least Sandpiper. We had scope views of a large group of Brown Pelicans, Royal Tern, and juvenile Laughing Gulls. After this great boat trip we returned to the Villa Lapas hotel to collect our luggage and get lunch and then started the drive back to Alajuela. During the drive back we made a couple of selective stops while passing through some deciduous habitats, where we had nice views of Black-headed Trogon, Cinnamon Hummingbird, Tropical Gnatcatcher, White-lored Gnatcatcher, Lesser Greenlet, Scrub Euphonia, and Stripe-headed Sparrow. We went back to the hotel to have our last meal together and share laughs and a couple of drinks to celebrate a very good birding week in Costa Rica. Costa Rica Pura Vida! Our international flights left today from Juan Santamaría International Airport. Great Tinamou Tinamus major Great views of two individuals at La Selva. Here the subspecies castaneiceps. Tinamous are generally shy and can be scarce as a result of hundreds of years of hunting by man. Tinamous are endemic to the Neotropics and are among the oldest families in the New World and among the most primitive of birds, as they conserve certain reptilian features, such as their blood proteins and the shape of the palate, which is similar to that found in the dinosaur Tyrannosaurus rex. The species is classified as Near-threatened. Crested Guan Penelope purpurascens Two birds were spotted by Debbie during our afternoon at La Selva Biological Station. Green Heron Butorides virescens Seen along the Tárcoles River. Green and Striated Herons are bait-fishing herons that attract fish by placing bait – insects, flowers, seeds, twigs, bread, even popcorn – on the water’s surface. King Vulture Sarcoramphus papa This awesome species was seen only at Carara National Park. Zone-tailed Hawk Buteo albonotatus One seen on the Pacific slope. Zone-tailed Hawks soar with their wings held in a dihedral position (pointing slightly upwards), rocking from side to side, a flight style that parallels that of turkey vultures. Some ornithologists believe that this mimicry tricks potential prey animals into not being alarmed when a Zone-tailed Hawk flies overhead (Clark 2004). Grey-chested Dove Leptotila cassinii One managed to get caught in the dining room of La Selva Biological Station. We managed to get good views before we set it free. Squirrel Cuckoo Piaya cayana One was seen at our hotel in San José and later we saw it at the La Paz Waterfall. Mangrove Hummingbird Amazilia boucardi One bird was seen during the boat trip in the mangroves of the Tárcoles. A Costa Rica endemic. The species is classified as Endangered. Grey-tailed Mountaingem Lampornis cinereicauda Seen at Savegre and Myriam’s feeders. A Costa Rica endemic. IOC has split Grey-tailed Mountaingem Lampornis cinereicauda from White-throated Mountaingem Lampornis castaneoventris, with Grey-tailed Mountaingem found in Costa Rica only and White-throated Mountaingem in Panama. Resplendent Quetzal Pharomachrus mocinno Amazing view of one male near Savegre. One of the most-wanted species in the Neotropics. The Resplendent Quetzal plays an important role in various types of Mesoamerican mythology. It is the national bird of Guatemala, and its image is found on the country’s flag and coat of arms. It also lends its name to the country’s currency, the Guatemalan quetzal. The Resplendent Quetzal was considered divine, associated with the “snake god”, Quetzalcoatl, by pre-Columbian Mesoamerican civilizations. Its iridescent green tail feathers, symbols for spring plant growth, were venerated by the ancient Aztecs and Maya, who viewed the quetzal as the “god of the air” and as a symbol of goodness and light. The Maya also viewed the quetzal symbolizing freedom and wealth, due to their view of quetzals dying in captivity and the value of their feathers, respectively. Mesoamerican rulers and some nobility of other ranks wore headdresses made from quetzal feathers, symbolically connecting them to Quetzalcoatl. Since it was a crime to kill a quetzal, the bird was simply captured, its long tail feathers plucked, and was set free. In several Mesoamerican languages the term for quetzal can also mean precious, sacred, or erected. The species is classified as Near-threatened. Rufous-tailed Jacamar Galbula ruficauda Great views at La Selva Biological Station. Here the subspecies melanogenia. Jacamars are insectivores, taking a variety of insect prey (many specialize on butterflies and moths) by hawking in the air. Birds sit in favored perches and sally toward the prey when it is close enough. Prong-billed Barbet Semnornis frantzii Great views on the La Paz Waterfall trails. Found in Costa Rica and Panama. Prong-billed Barbet together with the Toucan Barbet from Colombia and Ecuador are the only members of the Semnornithidae family, which are different from the Capitonidae family, which comprises New World barbets. Yellow-throated Toucan Ramphastos ambiguus Nice views on the Caribbean slope and at La Selva. Here the subspecies swainsonii. It used to be known as Black-mandibled Toucan and Chestnut-mandibled Toucan. Ramphastos swainsonii is an uncertain split from R. ambiguus (AOU 1998, Ridgely and Greenfield 2001, Dickinson 2003); SACC 440 and NACC 2010-B-13 lump). Yellow-throated Toucan is the appropriate English names for this species (SACC 663). The species is classified as Near-threatened. Hoffmann’s Woodpecker Melanerpes hoffmannii Several views of this species throughout the trip. Named after Karl Hoffmann (7 December 1823 – 11 May 1859), a German physician and naturalist in Costa Rica. In 1853 he traveled to Costa Rica with Alexander von Frantzius to collect natural history specimens. With his wife, Emilia Hoffmann, he settled in San José, where he operated a consultation clinic and small pharmacy from his home. In order to supplement his income he sold wine and liquor. He served as a doctor in the Costa Rican army during the invasion of William Walker in 1856. He died of typhoid in Puntarenas. 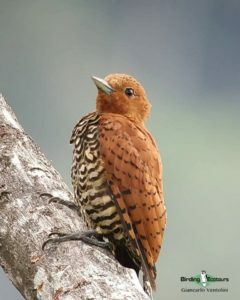 Hoffmann is commemorated in the names of a number of animals, including Hoffmann’s two-toed sloth (Choloepus hoffmanni), Hoffmann’s Woodpecker (Melanerpes hoffmannii), Sulphur-winged Parakeet (Pyrrhura hoffmanni), Hoffmann’s Antthrush (Formicarius hoffmanni), Hoffmann’s earth snake (Geophis hoffmanni), and a millipede Chondrodesmus hoffmanni (Peters, 1864). Cinnamon Woodpecker Celeus loricatus After several trials we managed to see one well near the Cope Wildlife Reserve. Bat Falcon Falco rufigularis Scope views on two different occasions. Bat Falcons perch conspicuously on high, open snags, from which they launch aerial attacks on their prey. They hunt bats, birds, and large insects such as dragonflies. The smaller male takes more insects and the female more birds and bats. The flight is direct and powerful. This falcon is partly crepuscular, as the bats in its diet suggest. It lays two or three brown eggs in an unlined treehole nest. White-crowned Parrot Pionus senilis A large flock was seen near the La Paz Waterfall. Northern Mealy Amazon Amazona guatemalae Two seen flying by near Villa Lapas. Northern Mealy Amazon is split from [Southern] Mealy Amazon (Wenner et al. 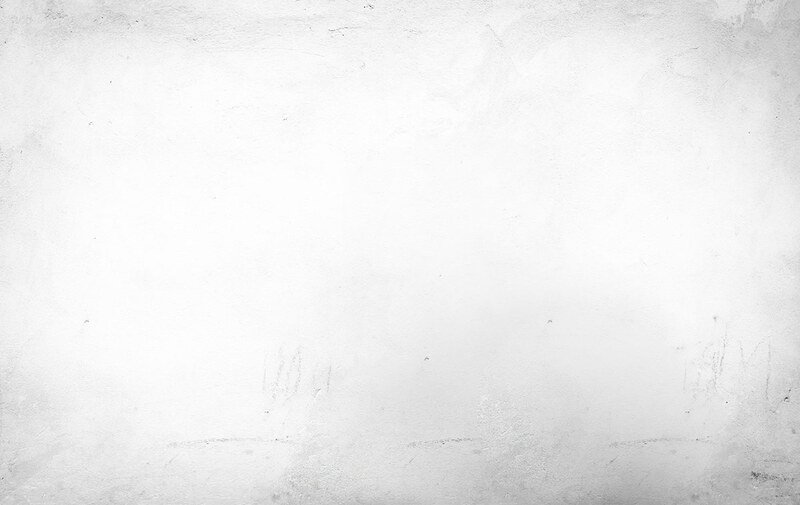 2012, HBW Alive). Northern Mealy Amazon ranges from Mexico to W Panama, while Southern Mealy Amazon Amazona farinosa ranges from Panama to Bolivia. The species is classified as Near-threatened. Great Green Macaw Ara ambiguus Seen flying by at La Selva Biological Station. Only a few of us had the opportunity to see them perch. The species is classified as Endangered. Scarlet Macaw Ara macao It was magic indeed to see some of these beautiful and colorful birds flying by on the shores of the Pacific Ocean and above Villa Lapas as well. Olivaceous Woodcreeper Sittasomus griseicapillus Seen well at La Selva Biological Station and in Carara National Park. Here the subspecies sylvioides. Keep records of your sightings of this species because it could be split in the future into at least four different species. Zeledon’s Antbird Hafferia zeledoni Brief views along the bridge track below Cinchona. Zeledon’s Antbird is split from Immaculate Antbird M. immaculata (Donegan 2012, SACC 541, 568). Moved from Myrmeciza to Hafferia (Isler et al. 2013). Mistletoe Tyrannulet Zimmerius parvus Great views at a few locations. Zimmerius parvus is split from Paltry Tyrannulet (Z. vilissimus) (Rheindt et al. 2013). Black-capped Pygmy Tyrant (H) Myiornis atricapillus This species was heard near Cope Wildlife Reserve. Sadly, it did not play for us. Snowy Cotinga Carpodectes nitidus A female was seen at La Selva Biological Station. Three-wattled Bellbird Procnias tricarunculatus Scope views of a young male near the Braulio Carrillo National Park during the search for the Snowcap. The species is classified as Vulnerable. Orange-collared Manakin Manacus aurantiacus Hard to see, but some of us managed to get a view of this bird at Carara National Park. Red-capped Manakin Ceratopipra mentalis Watching six males taking an evening bath in Carara National Park was very special. White-winged Becard Pachyramphus polychopterus One was seen at Carara National Park. Rose-throated Becard Pachyramphus aglaiae A female was seen in the deciduous habitat on the way back to San José. House Wren Troglodytes aedon Only one sighting on the Pacific slope! Cabanis’s Wren Cantorchilus modestus Brief views while standing at the crocodile bridge near Villa Lapas. Change English name of Plain Wren Cantorchilus modestus to Cabanis’s Wren with split of Canebrake Wren (NACC 2016-C-14). Includes roberti and vanrossemi. Treat as monotypic. Saucier et al. 2015. Grey-breasted Wood Wren Henicorhina leucophrys One seen at La Paz Waterfall. Here the subspecies collina. Even though the species is widespread in the Neotropics the subspecies collina is found in Costa Rica and Panama only. Black-billed Nightingale-Thrush Catharus gracilirostris Seen above Savegre during our drive to Los Quetzales National Park. Here the nominate subspecies. Sooty Thrush Turdus nigrescens Good views at Savegre and Myriam’s feeders. Found in Costa Rica and Panama. The species is classified as Near-threatened. American Dipper Cinclus mexicanus Two birds were seen nicely near Virgen del Socorro. This was a lifer for the leader. Golden-winged Warbler Vermivora chrysoptera Nice views at La Paz Waterfall and at Cinchona. The species is classified as Near-threatened. Grey-crowned Yellowthroat Geothlypis poliocephala One was seen well near Jaco Beach on the way to Villa Lapas. White-shouldered Tanager Tachyphonus luctuosus Two individuals were taking a bath in the manakin stream. Scarlet-rumped Tanager Ramphocelus passerinii Seen at several locations on the trip. Change English name of R. passerinii from Passerini’s Tanager to Scarlet-rumped Tanager following lump of Cherrei’s Tanager R. p. cherreii. Mantled Howler (Mantled Howler Monkey) Alouatta palliata Seen at La Selva Biological Station. The mantled howler is one of the largest Central American monkeys, and males can weigh up to 9.8 kg (22 lb.). It is the only Central American monkey that eats large quantities of leaves; it has several adaptations to this folivorous diet. Since leaves are difficult to digest and provide less energy than most foods, the mantled howler spends the majority of each day resting and sleeping. The male mantled howler has an enlarged hyoid bone, a hollow bone near the vocal cords, which amplifies the calls made by the male; this is the reason for the name “howler”. Howling allows the monkeys to locate each other without expending energy on moving or risking physical confrontation. Central American Spider Monkey (Geoffroy’s Spider Monkey) Ateles geoffroyi One was photographed by Debbie in Carara National Park. Collared Peccary Pecari tajacu A family group was seen at La Selva Biological Station. Crab-eating Raccoon Procyon cancrivorus A glimpse of one individual at the mangroves of Río Tárcoles. It is found from Costa Rica south through most areas of South America east of the Andes down to northern Argentina and Uruguay. That it is called the crab-eating raccoon does not mean that only this species eats crabs, as the common raccoon also seeks and eats crabs where they are available. The crab-eating raccoon eats crab, lobster, crayfish and other crustaceans and shellfish, such as oysters and clams. It is an omnivore, and its diet includes, for example, small amphibians, turtle eggs, and fruits. It resembles its northern cousin, the common raccoon, in having a bushy ringed tail and “bandit mask” of fur around its eyes. Unlike the common raccoon, the hair on the nape of the neck points toward the head, rather than backward. Common House Gecko Hemidactylus frenatus This is a species of house gecko native to sub-Saharan Africa. It is also currently found in North, Central and South America and the Caribbean, where it has been inadvertently introduced by humans. American Crocodile Crocodylus acutus Seen at the Tárcoles River and from the bridge near Villa Lapas. It inhabits waters such as mangrove swamps, river mouths, fresh waters, and salt lakes, and can even be found at sea, hence its wide distribution throughout the Caribbean islands, southern Florida, the Greater Antilles, southern Mexico, Central America, and the South American countries of Colombia and Ecuador. American crocodiles in the United States coexist with the American alligator and are primarily found south of the latitude of Miami, in Everglades National Park, Florida Bay, Biscayne Bay, and the Florida Keys. Because of hide hunting, pollution, loss of habitat, and commercial farming, the American crocodile is endangered in parts of its range.